Pattaya has a lot more to offer than the seediness for which it's famous. From beautiful beaches, to interactive art museums, to lush botanical gardens and even wineries, Pattaya is a dynamic and diverse destination — and it's only getting started. 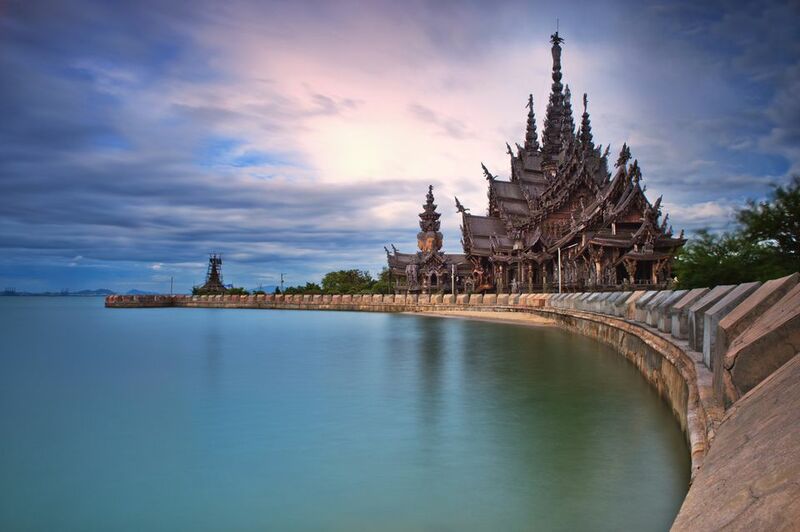 One Pattaya attraction that's of particular intrigue is the so-called Sanctuary of Truth, located about 15 minutes north of the city along the coast. Continue reading to learn more about the history of Pattaya's Sanctuary of Truth, all the things you can do there, how to plan a visit and what to do nearby after you've finished exploring. In 1981, a Thai businessman by the name of Lek Viriyaphant decided he wanted to build something in Pattaya. A notable patron of the arts (and notorious eccentric) who sadly passed away in 2000, Mr. Viriyaphant also funded the Erawan Museum outside Bangkok, which sits in Samut Prakan province not far from Suvarnabhumi Airport. In its present state, the Sanctuary of Truth is impressive to say the least — its main spire rises 300 feet into the air, and the site covers nearly an acre. However, the Sanctuary of Truth is not yet complete. Like Barcelona's Sagrada Familia, its anticipated completion date is sometime later this century—2050 has been cited as a target, though whether that target will be met is another story entirely. Constructed entirely of teak wood, the Sanctuary of Truth embodies a style that can best be described as "Visionary Art." Which is to say it uses visual motifs to drive home a theological point of view, in this case one inspired largely by Hinduism and Thailand's national religion of Buddhism. One of the main things to do in the Sanctuary of Truth is to see visual manifestations of important eastern religious concepts, including man's relationship with the Universe, and the Buddhist cycle of life. The Sanctuary of Truth is also a survey of the many architectural styles that have existed across Indochina over the past several millennia. Travelers who've visited the ancient city of Ayutthaya north of Bangkok will recognize conspicuous similarities at the Sanctuary of Truth, but more divergent inspirations are present as well. Notably, the Sanctuary is home to four gopura entrance towers, structures you usually find at Dravidian temples in the Tamil Nadu and Karnataka states of South India. Of course, you needn't think of your visit to the Sanctuary of Truth as a history lesson, even if multi-lingual informational placards will give you all the context and background you need. The visual aspect of the Sanctuary alone is overwhelming, and is a great place to hone your photography, or to take some selfies that are sure to command hundreds of Instagram likes, if that's more your style. Located in Na Kluea neighborhood just north of Pattaya's main beach, the Sanctuary of Truth takes about 20-30 minutes to reach by car, depending on traffic conditions in the city center. Although Pattaya lacks an urban rail network, you can ride any northbound minibus from the "Dolphin Roundabout" in the city center, which costs 10 baht, and also takes around 30 minutes. Make sure to tell the driver you're going to Prasat Sajja Tham, as the Sanctuary is known in the Thai language. Once you arrive at the Sanctuary, you'll need to pay 500 baht for admission. This isn't cheap, but as you've probably seen throughout this article, the grounds are both expansive and impressive. Plan on spending at least a couple of hours here in order to get your money's worth. The Sanctuary of Truth sits near Art in Paradise, an interactive 3D art exhibit that's not shy about incorporating paradisiacal Thai scenery into its exhibition. If it's convenience you're after, you can easily paid these two attractions together for a morning or afternoon that transcends the experience most travelers to Pattaya have. Beyond this, Pattaya is a surprisingly diverse destination, particularly if what you know of the city is limited to innuendo you heard spouted on the streets of Bangkok. Ride a boat to beautiful Koh Laan island, scale the city's viewpoint for a gorgeous panorama or visit Pattaya's own floating market—eating pad Thai from a boat isn't something you can only do in Bangkok!